From the beginning of human civilization, there has always been a need for surveillance systems. The reasons are numerous: borders guarding, raiders, spies and thieves protections. The Sun Tzu's Art of War, written more than 2,000 years ago, explains how to use spies against enemies. During thousands of years, there were only one kind of surveillance system with two kinds of actors (or creatures): human beings and dogs. It was more or less efficient depending on the hour of the day.However, electronics and Information Technologies (IT) gave the surveillance new possibilities, making it more efficient and more robust. Cameras are popping up all over the place. You can find them at retail businesses, factory floors, homes, apartments, landmarks, schools, financial institutions and transportation centers, to name but a few. Applications range from basic security and safety to quality control monitoring. Keywords: IP camera surveillance, real-time, surveillance system, monitors. Security system using IP camera project is about monitoring system that can be implemented by user in real time. The system will allow user to view the movement and direction of the individual cameras over the computer via LAN. This project consists of IP camera as surveillance Medium which is controlled by software designed using zoneminder to run as surveillance system. This surveillance system is use to monitor, supervise, inspection and to look up a person or a target area and also can be operate in local area network. Security cameras and Surveillance is the monitoring of behavior; a surveillance system is a system designed to process and monitors the behavior of people, objects or processes within a given system for conformity to expected/desired norms in trusted systems for security/social control. It can be either secrete or evident. Although the word surveillance literally means “watching over”, the term is often used for all forms of observation or monitoring, not just visual observation. Nevertheless, the all-seeing “eye in the sky” is still a general icon of surveillance. Surveillance in many modern cities and buildings often uses IP cameras . 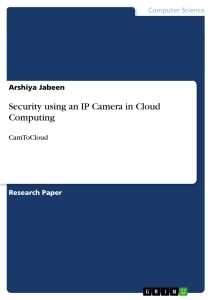 In this paper, we focus on keying mechanisms for the surveillance system and the security provided by ip camera.. An IP camera is a type of digital video camera commonly employed for surveillance, and which unlike analog closed circuit television (CCTV) cameras can send and receive data via a computer network and the Internet. Monitoring and recording can be performed by entirely software-based network video recorders (NVRs) running on standard PC hardware. Advanced video analytics software can be used to automatically detect suspicious events or behavior without having to continuously monitor dozens or hundreds of screens. The fast progresses in developing new types of data networks and transmission techniques, leads to various methods of implementing video surveillance systems. For example IP video surveillance creates a video stream transferred through wired or wireless networks, for video data monitoring and recording, and also integrates other types of systems as access control. IP video cameras can be directly connected to an IP network, allowing users to remotely monitor record and analyze images at long distance, including Internet links. Designing a video surveillance solution requires decisions on 8 fundamental questions. This in-depth tutorial helps beginners understand the options and tradeoffs involved in designing a solid surveillance solution. - What type of cameras should I use? - How should I connect cameras to video management systems? - What type of video management system should I use? - What type of storage should I use? - How should I record video? - What type of video analytics should I use? - How should I view my surveillance video? - How should I integrate video with my other systems? There are immediate needs for computerized surveillance systems in commercial, law enforcement and military applications. Although surveillance cameras are already prevalent in banks, stores, and parking lots, video data currently is used only “after the fact” as a forensic tool, thus losing its primary benefit as an active, real-time medium. What is needed is continuous 24-hour monitoring of surveillance video to alert security officers to a burglary in progress, or to a suspicious individual loitering in the park lot, while there is still time to prevent the crime. In addition to the obvious security applications, IP camera surveillance technology has been proposed to measure traffic flow, detect accidents on highways, monitor pedestrian congestion in public spaces, and compile consumer demographics in shopping malls and amusement parks, log routine maintenance tasks at the nuclear facilities, and count endangered species. The numerous military applications include patrolling national borders, measuring the flow of refugees in troubled areas, monitoring peace treaties, and providing secure perimeters around bases and embassies. 3. ARCHITECTURE OF AN IP CAMERA. IP cameras transmit video using open internet protocols and standards (mainly HTTP) for recording or monitoring. The camera has a built in web server. This means it can operate as a standalone product, accessed by its IP address and therefore does not require a PC/workstation to function. This provides an economical method to monitor a household from a remote location. These cameras use the HTTP protocol to issue and receive instructions or data to or from an external network source. The network connection can be made using any device with Ethernet or Wi-Fi interface, but a better flexibility is achieved with an Internet connection, done through a router (wired or wireless). In our application we use a Canyon CN-WF514 Wi-Fi router. The general configuration of the connection is presented in figure 1.For viewing images from camera in a local network, the video camera IP address is used in a web browser, while for connections outside the LAN, the browser will access the IP address of the router, which will send the access request to the IP camera Welcome to ZoneMinder, the all-in-one Linux GPL'd security camera solution.